Sep 27, 2013 • Speeding around the Earth at 16,800 mph (27,000 kph), two Landsat satellites are quietly, expertly watching and recording changes in Earth’s lands from space. They are gathering data for people to make maps–all kinds of wonderful maps–of our cities growing, rivers flooding, lava flowing from volcanic eruptions, forests expanding or shrinking, crops greening through the growing season, and even of evidence of pollution. One of the most wonderful aspects of Landsat is that all the data are available to everyone, so people can use Landsat to make maps of their own. Landsat satellites are special in many ways. They record the entire global land surface every season, every year– and they have been doing it since 1972. They tell the story of how our landscapes have been changing for over 40 years! The Landsat 5 satellite even made it to the Guinness Book of World Records for having the longest life of any satellite in history: almost 29 years. The engineers and scientists overcame dozens of difficult technical challenges to keep this valuable satellite flying and delivering data. 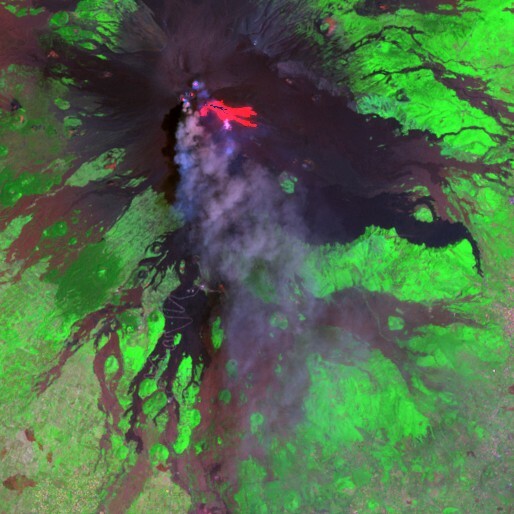 “The efforts of the Landsat team were heroic,” said Jim Irons, project scientist for Landsat 8. At left, a visitor to the Smithsonian Mall explores a Landsat scene of Washington DC on Earth Day 2012. At right, thousands of Landsat scenes together make up a mosaic of the continental United States. Credit: NASA. Landsat provides images of Earth at a resolution of 30 m, about the size of a baseball infield. People are too small to appear in a Landsat scene, but neighborhoods can be seen. Larger streets and schools, shopping centers, and most open spaces are visible, as are glaciers and volcanic eruptions. Landsat satellites measure the same colors of light that your eyes see, which are combined shades of red, green, and blue light. Satellite images made with red, green, and blue show the Earth as you would see it if you were in space. 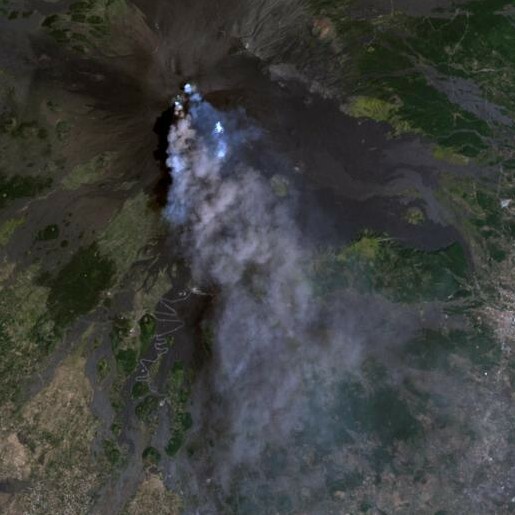 Below is an example of how you might see the volcano Mount Etna erupting in 2001, using Landsat’s visible wavelengths. You can see lots of smoke and ash billowing from the volcano. But Landsat lets us see more than smoke and ash clouds. We can also see heat being reflected from the hot volcanic surface, using infrared light that our eyes alone cannot detect. Software for Landsat data analysis helps us to translate data on the infrared light into images we can see. Below is the same scene as the one above, but this version of the scene uses a combination of some visible green light and some infrared light. What can you see, now that infrared light has been added? The scene with infrared light is showing us where the hot lava is pouring from the volcano. If you were at the volcano and wanted to run from the lava, which way would you turn? The wavelength ranges used by Landsat 8 (launched in February 2013) are these: deep blue, blue, green, red, four near and shortwave infrared bands, a panchromatic (grayscale) band, and two thermal Infrared bands. Yellowstone National Park was burning in August 1988, at left. The heat signals of areas that are burning or have just burned were captured by the infrared sensitivity of Landsat and appear here in reds. (Some of the hot areas are obscured by bluish smoke.) By late September 2011, 23 years later, pinkish areas show recovery from fire. Some of the burned area is covered once again by trees and vegetation. 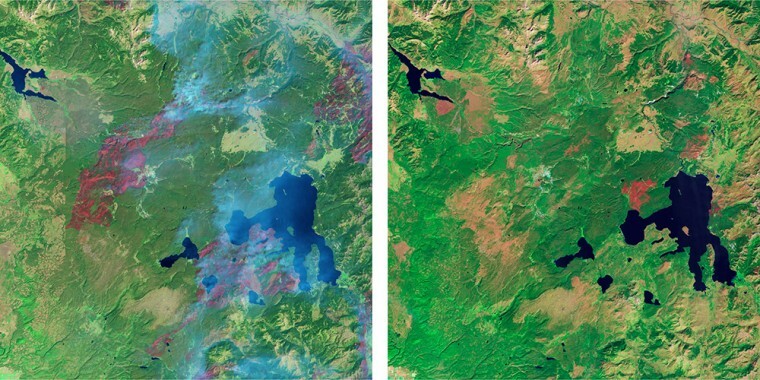 Satellites like Landsat can provide the big picture of ecosystem recovery. People who manage our water for drinking and farming also prize Landsat’s capabilities for combining visible light and infrared light. 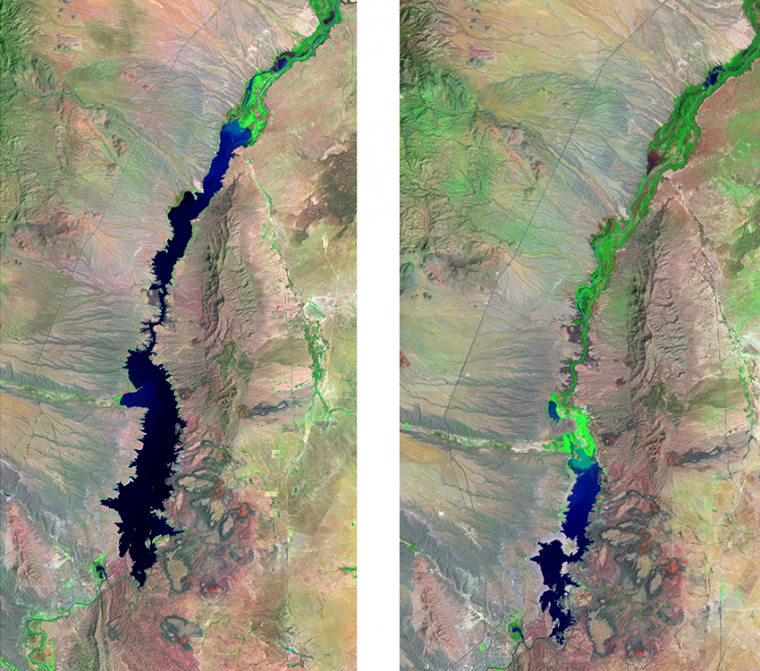 Consider how we can see water levels in Elephant Butte Reservoir, New Mexico with Landsat, as they have changed from August 1991 (at left) to 2013 (at right). In this visible-infrared light combination, blue and dark blue areas indicate water and bright green areas indicate vegetation that has replaced open water. Tones of pink and beige indicate little or no vegetation. Does this change from 1991 to 2013 look dramatic to you? It does to the people who depend on this water for consumption, recreation and energy production! The water level in the reservoir in summer 2013 was the lowest it had been for 40 years. Landsat images combining visible and infrared wavelengths of the Columbia Glacier in Alaska show a rapidly thinning glacier whose terminus has dramatically retreated from 1986 to 2010. With this combination of wavelengths, snow and ice appear bright cyan and the open ocean is dark blue. Vegetation is green, exposed rock is brown, and rocky debris on the glacier’s surface is gray. By the differences in cyan and dark blue, one can see that where the ice stopped in 1986 is far south of where it stopped during the same season in 2010. Ice moving from land to oceans and warming ocean water are important contributors to global sea-level rise. Making images with Landsat that combine visible and infrared wavelengths helps us to see and map our planet’s lands in new ways. S. S. Hall, author of Landsat Maps and the Remote-Sensing Revolution, put it this way, “… Landsat revealed whole new worlds hidden within the folds of a familiar world we thought we knew so well.” Landsat 8 is doing extremely well in its orbit above the Earth, sending us more than 400 scenes every day. We have a lot of mapping to look forward to! This entry is filed under Agriculture, Carbon and Climate, Fire, News, Water.